Stuart Brittle (#24) scored 4+1 in the game against Dragons N2 and is the Wild’s top scorer overall with 15+16 from 14 games. The RTL-sponsored Widnes Wild made it three wins in a row and moved to within a point of the league leaders in the Laidler Division with an entertaining 11-6 win over local rivals Deeside Dragons at Silver Blades Widnes on Sunday. Prior to the weekend, the game against the league’s bottom club had looked little more than a formality but a morale boosting 12-3 win over the Blackburn Hawks N2 team the night before saw the Dragons development team arrive in buoyant mood and, with several of their number having played for teams at Widnes in recent times, all had a point to prove. The game started off pretty much according to league form with the Wild taking the lead after just 4 minutes with a well worked goal from Stuart Brittle – who then went on to add a second just 2½ minutes later while Widnes were shorthanded due to a slashing penalty on Mikey Gilbert. Matty Barlow made it 3-0 for Widnes on the 9 minute mark and the Wild looked to be cruising. They out-shot the Dragons 19 to 10 in the first period and, while 18 year old Tegan Lavery made some incredible saves in the Deeside net, it looked only a matter of time until the floodgates opened. But that did not happen. The Dragons scored the next goal – somewhat against the run of play – on 14 minutes and the score remained 3-1 to Widnes at the first break. A goal from Wild’s Nick Manning 2 minutes after the restart looked to have set Widnes on their way again but the Dragons hit back with two goals – one from old campaigner Steve Fellows and one from former Wild import Michal Fico – to bring the scoreline to 4-3 approaching the half way stage. 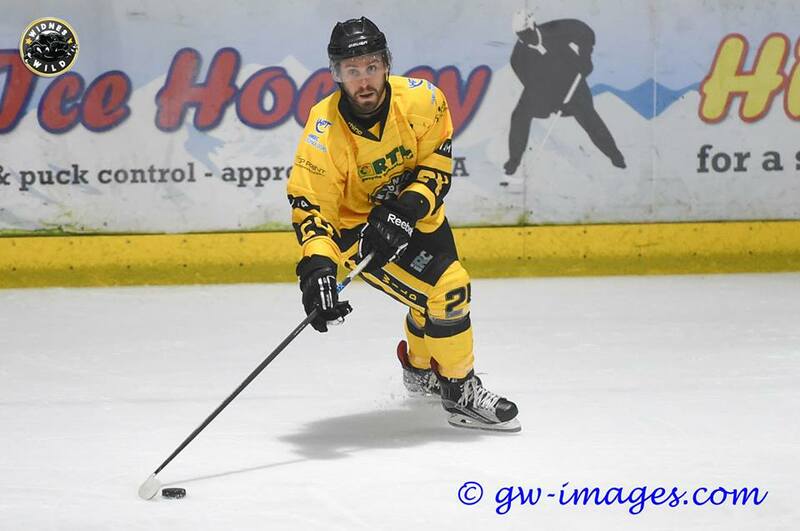 A powerplay goal from Brittle on 32 minutes – his hat trick goal – edged the Wild further ahead again but they were pegged back by another Dragons strike two minute later and the rest of the period remained goal-less to leave the score standing at a tantalising 5-4 after two periods. The Dragons got themselves into penalty trouble at the start of the third period and each of their three transgressions was punished with a powerplay goal by the Wild, who came out of the dressing room fully fired up for the final 20 minutes. The first came from Wild player coach Ollie Barron at 41.35 and then another from Nick Manning less than 2 minutes later. The third unanswered goal came just on 45 minutes and was scored by new Widnes signing Kyle Haslam who joined the club during the week from Blackburn and whose registration was confirmed just minutes before face off, enabling him to play in the game. At 8-4 down, there wasn’t going to any way back for the Dragons and the Wild peppered the Deeside goal with shots – totalling 28 for the period. Despite the one way traffic, the visitors did, in fact, manage two more goals from the 6 shots they achieved on the Widnes net, both scored by Gez Evans to notch up a hat trick for the former Riverside Raiders recreational player. But the Wild steam-rollered on and three more goals – from Brittle (his fourth of the night), a short handed effort by Mikey Gilbert and then a great strike by Bez Hughes four minutes from the end – rounded off the scoring for the evening. The win sees the Wild move to within one point of league leaders Altrincham Aces who lost 5-0 away to Sutton Sting on Saturday night. The Wild have a game in hand over the Aces but third place Sutton have games in hand over both Widnes and Altrincham so there is still lots to play for as the season progresses. The Wild have two games next weekend – away to Sheffield Senators on Saturday and then at home to Hull Jets, who they have yet to play this season, at Silver Blades Widnes on Sunday. << It’s not Jeremy Kyle that Wild, it’s Kyle Haslam!